Back to posts Apereo OAE Heron is now available! 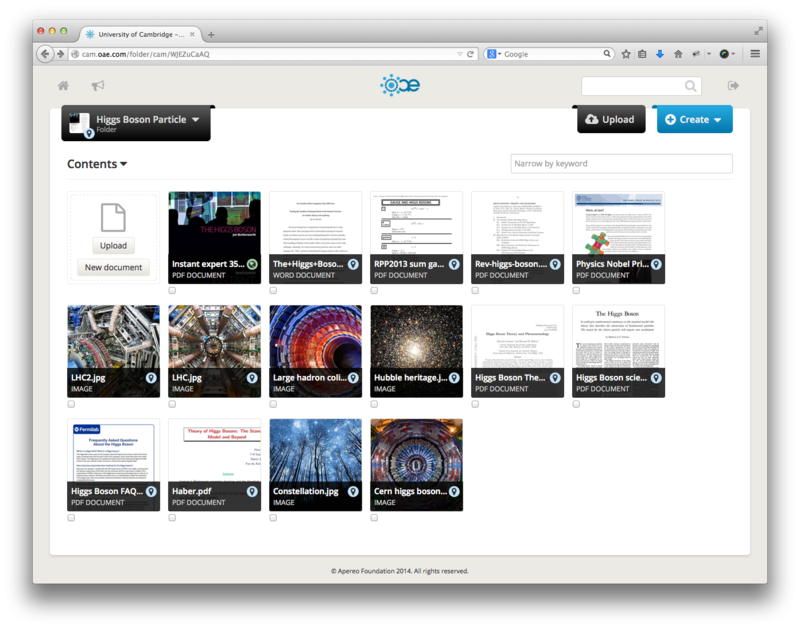 Apereo OAE Heron is now available! The Apereo Open Academic Environment (OAE) project team is extremely proud to announce the next major release of the Apereo Open Academic Environment; OAE Heron or OAE 9. OAE Heron is a landmark release that introduces the long awaited folders functionality, allowing for sets of content items to be collected, organised, shared and curated. OAE Heron also provides full support for Shibboleth access management federations and brings improvements to activities, (email) notifications and the REST API documentation. Next to that, OAE Heron also ships with a wide range of overall usability improvements. Using the personal and group libraries, Apereo OAE has always allowed collaboration to grow organically, reflecting how most of our collaborations work in real life. Individual content items could be shared with people and groups, making those items available in their respective libraries. This has always tested extremely well in usability testing, and not requiring the organisation of items upfront has been considered to reduce the obstacles to collaboration. However, sustained usage and usability testing have also highlighted a number of challenges with this approach. First of all, it was difficult to group items that logically belong together (e.g. a set of field trip pictures) and share and interact with them as a single unit. Next to that, heavy use of the system was showing that libraries could become quite hard to manage and were clearly lacking some form of organisation. Therefore, OAE introduces the long-awaited folders functionality, a feature we've been working on for an extended period of time and has gone through many rounds of usability testing. OAE Folders allow for a set of content items to be grouped into a folder. This folder can be shared with other people and groups and has its own permissions and metadata. A folder also has its own thumbnail picture based on the items inside of the folder and folders will generate helpful activities, notifications and emails. OAE folders also stay true to the OAE philosophy, and therefore content items are never bound to a folder. This means that the items in a folder can still be used as an independent content and can be shared, discussed, etc. individually. This also means that a content item can belong to multiple folders at the same time, opening the door for re-mixing content items and content curation, allowing new interesting folders to be created from existing folders and content items. Whilst maintaining the ability to grow collaboration organically, OAE Folders allow for a better and more logical organisation of content items and open the door to many interesting content re-use scenarios. Many countries around the world now expose their own Shibboleth access management federation. This provides an organised and managed way in which an application can be offered to many institutions at the same time, directly integrating with the institutional Single Sign On systems. OAE Heron makes it possible for an OAE installation to become a recognised Service Provider for one or more of these federations. This dramatically simplifies the tenant creation process for an institution that's a member of one of these access management federations, making it possible to set up an OAE tenant with full Shibboleth SSO integration in a matter of minutes. OAE Heron introduces significant email notification improvements for those users that have their email preference set to Immediate. OAE was already capable of aggregating a series of actions that happened in quick succession into a single email. OAE Heron makes this possible over a longer period of time, and will hold off sending an email until a series of events that would otherwise generate multiple email notifications has finished. This dramatically cuts down the number of emails that are sent out by OAE and provides a more intelligent email update to users. The display of email notifications on mobile devices has also been improved significantly, making the content of the email much easier to read. OAE Heron offers more descriptive activity summaries, especially in the area of content creation. These will for example provide a much better overview of the context in which an activity happened. Next to that, OAE Heron will also ensure that the indicator for the number of unread notifications a user has is always completely accurate. OAE Heron continues to build on the REST API documentation that was introduced in OAE Griffin. It makes all possible responses for each of the REST endpoints available through the documentation UI and further improves the quality of the available documentation. OAE Heron can be tried out on the project's QA server at http://oae.oae-qa0.oaeproject.org. It is worth noting that this server is actively used for testing and will be wiped and redeployed every night. Documentation on how to install the system can be found at https://github.com/oaeproject/Hilary/blob/9.0.0/README.md. Instruction on how to upgrade an OAE installation from version 8 to version 9 can be found at https://github.com/oaeproject/Hilary/wiki/OAE-Upgrade-Guide.